A multidisciplinary team effort is required to plan and design a dam. Ultimately, a civil engineer is responsible for the structure, but the civil engineer relies on information and advice from a team of specialists. Other specialists are also involved in the planning of a dam, including economists who work out the costs of the project, and environmentalists, biologists and conservationists who consider the effects that a reservoir will have on the local environment and the animal and plant life. Civil engineers work with other engineering specialists to draw together all of the information they provide to plan and design the overall layout of the dam and the other structures at the site. The position selected for the dam will depend on the amount of water it will hold back in the reservoir. It also needs to be located where the rock or soil is strong enough to support its weight. The civil engineers decide on the best type of dam for the site and on the most suitable materials to be used. They have to consider all of the forces that can act on the dam and its foundation. These include the force of the reservoir water on the dam and the effect of the weight of the dam on the materials within it and on the foundation below. In some regions, the effects of earthquakes have to be considered. 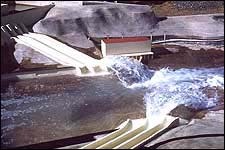 Civil engineers carry out mathematical calculations to model the dam and the effects of the forces on them. When the calculations get too complicated to do by hand they use computers. With these calculations they can make sure that they are designing safe structures. The pipework, valves and floodgates for dams are designed by mechanical engineers. The civil engineering designers are responsible for producing technical drawings showing how the dam is to be constructed. They also produce documents stating exactly how some of the construction processes should be carried out to make sure that the final dam is built to a high standard. Civil engineering contractors use this information to build the dam. Engineering geologists investigate the geology of the dam site and the area to be occupied by the reservoir. They provide an overall picture of the types of soils and rocks below the earth's surface, their thickness and the directions in which they slope. They assess the quality of the ground to determine whether leakage of water from the reservoir could occur. For embankment dams, geologists investigate nearby areas where natural materials can be excavated for their construction. Engineering geologists also consider whether the site of the proposed dam is in a region where earthquakes can occur. They look for the presence of any faults in the rocks and consider whether an earthquake could cause the fault to rupture. 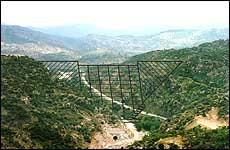 During the 1999 Chi-Chi Earthquake in Taiwan, the movement of a fault below the Shihkhang Dam actually broke the dam in two. Geotechnical engineers consider whether the rock or soil foundation below a dam is strong enough to support its weight. They check whether the dam foundation is permeable. If it is, then the foundation has to be treated to prevent water from the reservoir leaking out below or around the dam. 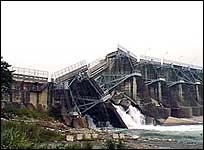 They are responsible for designing embankment dams, as they have an understanding of how rockfill and earthfill behave. Geotechnical engineers investigate the stability of the slopes around the reservoir too. If a landslide into the reservoir occurred, it could cause a large wave that could flow over the top of the dam and cause flooding of properties and deaths downstream. This happened at Vaiont Reservoir in Italy in 1963, and the resulting flood killed about 2200 people. Some geotechnical engineers spend a lot of time outdoors, collecting soil and rock samples from proposed dam sites. These samples are tested in laboratories to determine their properties, e.g. their strength and permeability. Engineering hydrologists, involved in the design of a dam, are interested in the quantity and movement of water at the site. They need to know how much rain and snow is likely to fall there, how much of it will soak into the ground and how it will move through the ground. With this knowledge they can work out the amount of water that would normally flow into the reservoir each year, and how big the reservoir needs to be to store it. They also estimate the size of the waves on the reservoir that would be caused by wind. This information helps determine the height of the dam. They also have to consider the worst snow or rainfall that could possibly occur, and they design spillways to make sure that excess floodwater can be passed safely through the reservoir without overtopping the dam. Engineering surveyors measure and survey the land at different sites that may be suitable for a proposed dam. They do this using computer-based measuring instruments, geographical knowledge and aerial photographs. With this information, they prepare up-to-date and detailed maps of the sites, which are used when choosing the best location for the dam and reservoir. The maps for the selected site are then used to help with the planning and design of the dam.